In Part 1 of this Cryptocurrency Trading Guide, you will find a list of factors that affect the price movements of cryptocurrencies. The cryptocurrency market is infamous for its erratic price fluctuations where the market can experience extreme upward and downward swings within minutes. As such, the cryptocurrency market has attracted the attention of many traders and investors, be it beginners or professionals. The market capitalization of cryptocurrencies has also grown exorbitantly over the past year, driven by the rapid rise in market share by popular cryptocurrencies like Bitcoin, Ethereum & Litecoin. Furthermore, the accessibility of cryptocurrencies for the mainstream market has been steadily increasing because of the rise of cryptocurrency exchanges globally and the implementation of better regulation. Traders and investors can easily deposit fiat currencies like US dollars, Singapore dollars, Canadian dollars and Malaysian Ringgit on secure trading platforms such as Coinut Exchange and begin buying or selling cryptocurrencies immediately. The Internet is filled with stories of many lucky & skilled traders who successfully invested in Bitcoin at the right time and earned multi-fold returns in a matter of a few days. However, the market has recently experienced a severe correction, resulting in many trader suffering severe losses. 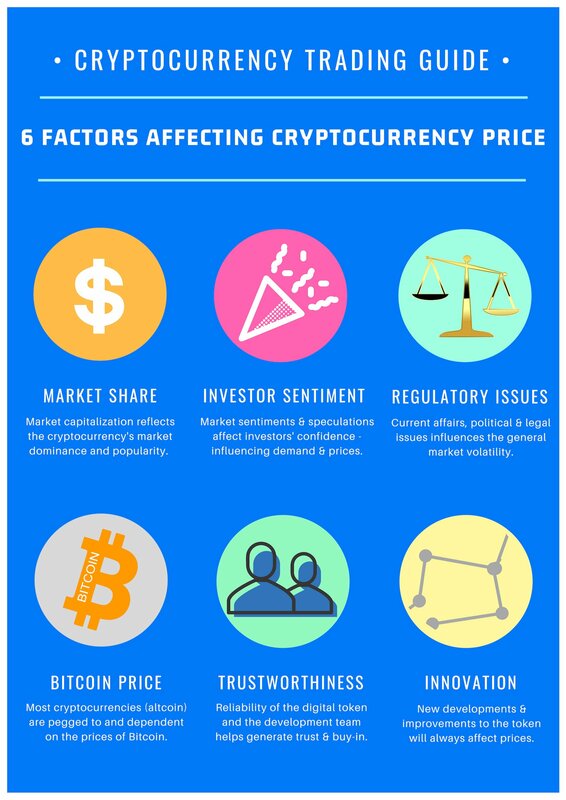 Based on our analysis, the prices of cryptocurrencies are mainly influenced by these factors as seen in the illustration above.